One fine morning, suddenly things get bad in Metropolis. Hi-tech probes fall from the sky and form a perimeter around one part of Metropolis, which includes the Daily Planet Building. As the Government issues a warning, our JLA members race to the scene. But they arrive too late.<br />The probes quickly activate and form a visible forcefield around the target part of the city. The heroes find that their variety of powers do not have any effect on the forcefield. People are caught inside and are being rendered unconscious by a gas.<br />Above Earth, Brainiac has arrived in his massive ship. He has returned to Earth because once before when he tried to conquer it, he was opposed, his attacks were thwarted and he was sent fleeing with his tail between his legs. However he has only one mission now, to study the inhabitants and control Earth for himself. 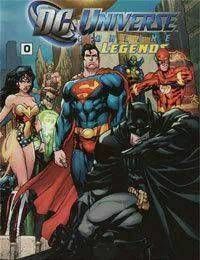 So he is digitizing parts of the world, and miniaturizing them for his purposes.<br />A few members of the JLA try to attack the ship but are powerless against Brainiacs defenses. As the shielded part of Metropolis vanishes before their eyes, Superman is seen worried about Lois Lane.